For years we have heard that Swedish gamer Felix “PewDiePie” Kjellberg has the largest channel on Youtube. He still has the highest number of subscribers by far, but there is reason to argue that he has been dethroned by a person you’ve probably never heard of – Gulshan Kumar. Kumar is the founder of an Indian music company called T-Series which also produces and distributes movies. T-Series is now India’s largest music label and movie studio (according to themselves). T-Series has a Youtube channel that currently is the 4th most subscribed channel. With 27.4 million subscribers, it is still a long way from beating PewDiePie’s 57 million. But then again, a subscriber is what might be characterized as a vanity metric, which means that it’s a number that does not really add value to your business in itself. Sure, without subscribers it is much harder to reach an audience, so they are not at all meaningless, rather it’s a means to an end. Even more interesting is looking at for example number of views of a channel, because that is actually a source of income for a youtuber. In other words, it is more important to get views than subscribers. The T-Series Youtube-channel is the most viewed on the entire network with a total of 25.6 billion video views. The second most viewed channel is WWE, World Wrestling Entertainment, with 17.9 billion views. PewDiePie is third with 16.3 billion views. That should by definition make the Indian company the largest Youtube channel. T-Series get almost ten times as many video views per months as PewDiePie. And there are probably two main reasons to the success of T-Series on Youtube, apart from the quality of the content of course. The second reason is that Indian audiences prefer to use Youtube for music and Facebook for news, according to a new study. “Undoubtedly, Youtube is India’s default music player and the most popular source for accessing music content,” Subrat Kar, CEO at Vidooly Media Tech — a Video Intelligence platform, said in a statement. With a userbase of over 400 million in India, Youtube is the biggest platform for video content, according to Indian Express. Further evidence of Youtube’s popularity in India is that there are at least two more Indian music channels with more than 11 billion channel views: SET India and Zee TV. That places them too near the top of the list. It is quite possible that Youtube’s charts will be dominated by Indian music companies in a not too distant future. I followed the events in Mumbai yesterday with one eye on CNN and one eye on Twitter. It was both fascinating and horryfying to follow the stream of short reports from people on the ground in India, complemented by comments from fellow twitterers from around the world. I use a service called TweetDeck to follow Twitter and during most of the day yesterday the program flashed about 20-30 new tweets about Mumbai at a time (posted to the channel #mumbai), several times a minute, and it still does. Some estimated that there were 80 messages posted about the events every five seconds. The graph below shows the huge volume (I counted more than 5,000 tweets during the latter part of yesterday) of tweets about Mumbai during the last days. Many eyewitness reports also came on for example blogs and photo sharing sites like Flickr. Blogs like Mumbai Help aggregated news reports and important phone numbers. And 27-year-old Vinukumar Rangnathan posted more than a hundred photos on Flickr which were viewed hundreds of thousands of times by people around the world. Some of them were even used by media outlets such as CNN. “I have been getting mails from several news channels and websites who wanted to host my pictures. I agreed,” he said. A search for photos tagged with “Mumbai” can be found here. While there are many benefits of this kind of citizen reporting, one should also use them with caution. A lot of rumours are circulating and this morning I noticed two tweets following right after each other were the first said that there were probably no ties to Al-Qaida, the second said the ties to Al-Qaida had now been confirmed. At one point yesterday, many messages on Twitter suddenly reported that the Indian government had asked people to stop tweeting about military operations in the area. The source of these rumours seemed to be a message from Twitter user Mumbaiupdates. Blogger Amy Gahran decided to try to track the source of this widely reported rumour and found out that the person behind the twitter account was not actually in Mumbai, but a high school junior based in Boston named Mark Bao. In an email to Garhan he explains the origins of his post. “The rumour started on via another twitter post that retweeted from another person that was a trusted source IN mumbai. Later, it was confirmed on video that the police wanted live updates of the operations to be stopped, though they did not mention the hashtag #Mumbai, though they asked media outlets to stop reporting live. 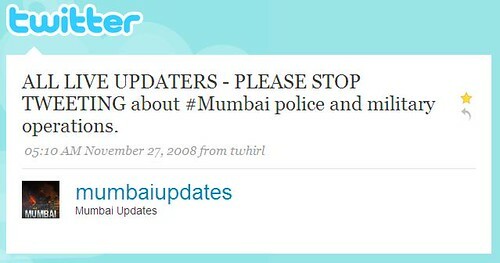 The purpose of [the MumbaiUpdates] stream was to disseminate info from the CNN-IBN, NDTV and those twittering from Mumbai. With any news reporting and re-reporting it’s possible errors got in the way. I’m sorry if it caused any confusion. So there is still no evidence that any Indian authorities have demanded that people should stop tweeting about specific stories in Mumbai. Read Amy Gahran’s full post, it is quite interesting. Tags: twitter, mumbai, mumbai, bombay, twitter. Ping.